Introduction: Scott Phillips is a genealogical historian and owner of Onward To Our Past® genealogy services. 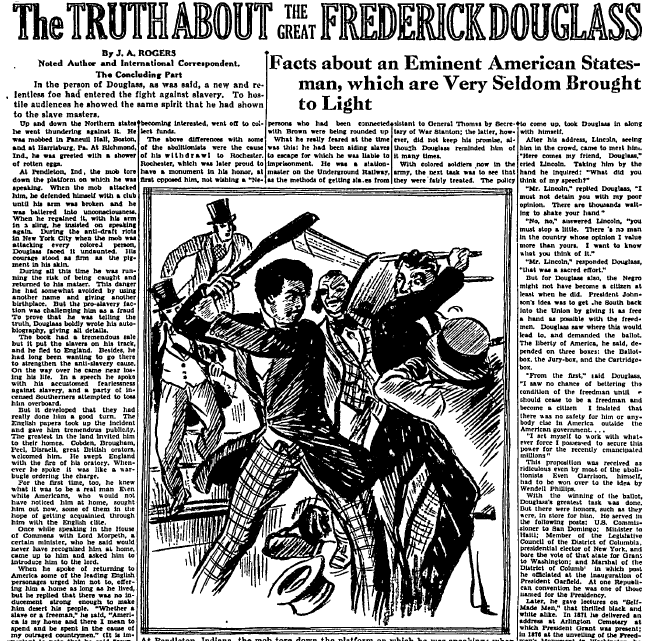 In this guest blog post, Scott searches old newspapers to learn about one of the great figures in American history: the African American abolitionist, Frederick Douglass. Exactly 119 years ago today, on 20 February 1895, America suddenly and unexpectedly lost one of its most impressive abolitionists, reformers, orators, writers, statesmen, and advocates for equal rights of all people: Frederick Douglass. Photo: Frederick Douglass. Credit: Wikipedia. Wanting to know more about this great African American, I turned to GenealogyBank’s Historical Newspaper Archives to look for old articles to learn about his life and times. I was not disappointed with my research findings. 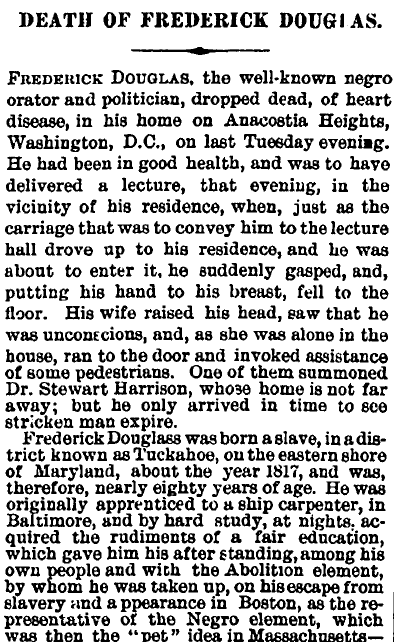 This obituary of Frederick Douglas appeared in an 1895 New York newspaper. All of us genealogy fans can always appreciate a well-written obituary, and this certainly is one. 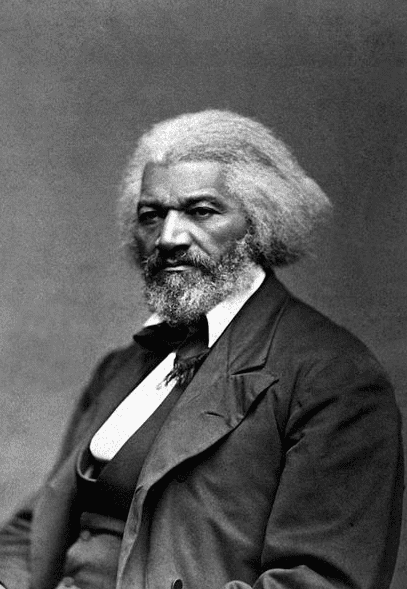 Born about 1817 as an African American slave on the eastern shore of Maryland, Frederick Douglass was born with the name of Frederick Augustus Washington Bailey. He proceeded to spend his life breaking just about every mold people tried to force him to fit. Douglass tried to escape slavery twice before he was finally successful, but once free, he was a wanted man. As a result, he had to change his name from Bailey, to Johnson, and then to Douglass—and as genealogy fans we can appreciate Douglass writing his autobiography, which helps us understand his changing name history. While we all wish this was the case throughout American history, we all know it certainly was not. 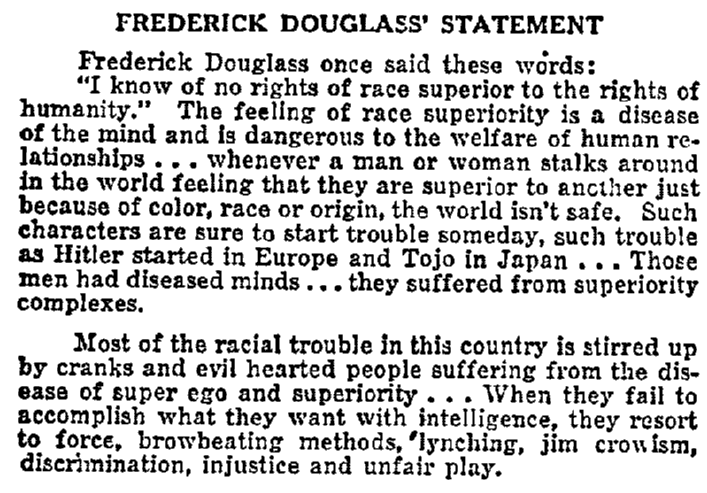 For an unvarnished view of just how challenging Frederick Douglass’s anti-slavery stand was, I strongly suggest that you look up and read this article from a 1930 Kansas newspaper. At Pendleton, Ind., the mob tore down the platform on which he was speaking. When the mob attacked him, he defended himself with a club until his arm was broken and he was battered into unconsciousness. When he regained it, with is arm in a sling, he insisted on speaking again. Slavery was not the only cause that Frederick Douglass fought for. 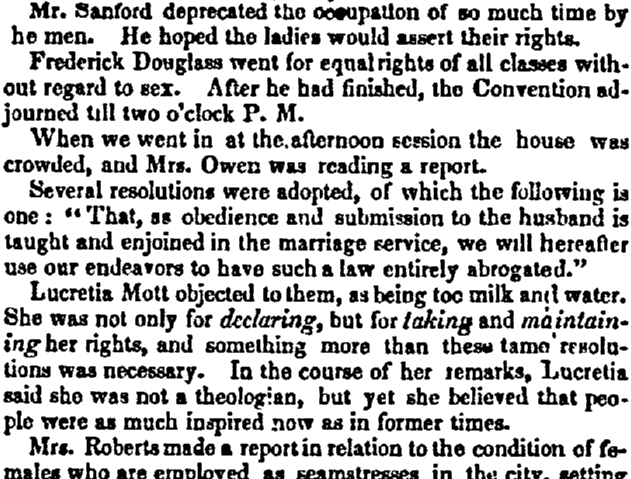 As you can read in this article from an 1848 Washington, D.C., newspaper, he supported the Women’s Rights Movement as well. Douglass spoke (he was the only African American invited to speak) at the first Women’s Rights Convention in Seneca Falls, New York, where he continued his strong advocacy for equal rights for women. Now, you will want to know how I was impressed by him [Lincoln]. He impressed me as being just what every one of you have been in the habit of calling him—an honest man. 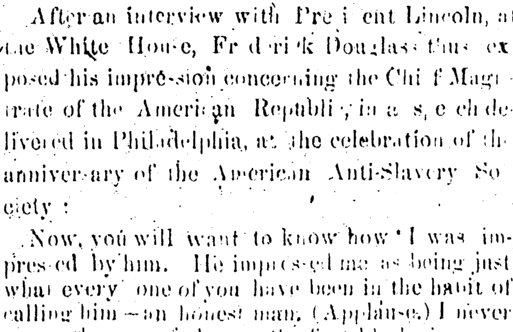 This old article from an 1891 Nebraska newspaper reported that Frederick Douglass advised President Lincoln on the Emancipation Proclamation, and was appointed the U.S. Minster to Hayti (now Haiti). 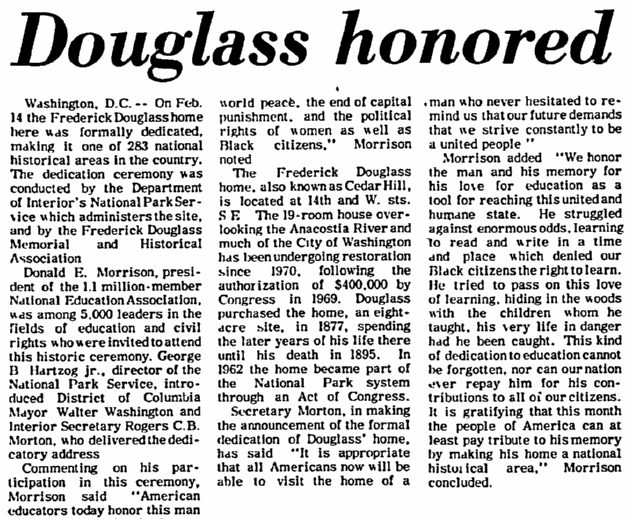 Moving toward more current times, the Douglass family home, known as Cedar Hill, became a National Historic Site and a part of our National Park Service, as you can read in this article from a 1972 Wisconsin newspaper. Note: one of the historical newspapers in GenealogyBank’s collection is the very newspaper edited and published by Frederick Douglass himself! 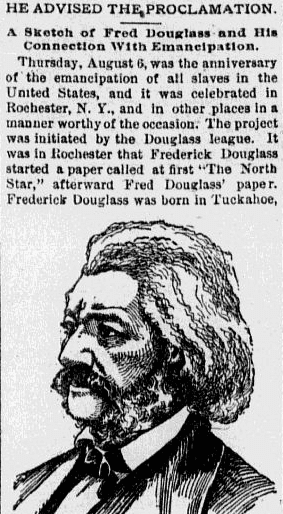 It is the Frederick Douglass’ Paper (Rochester, New York), where you can read entire issues of this newspaper from 1847 to 1860. 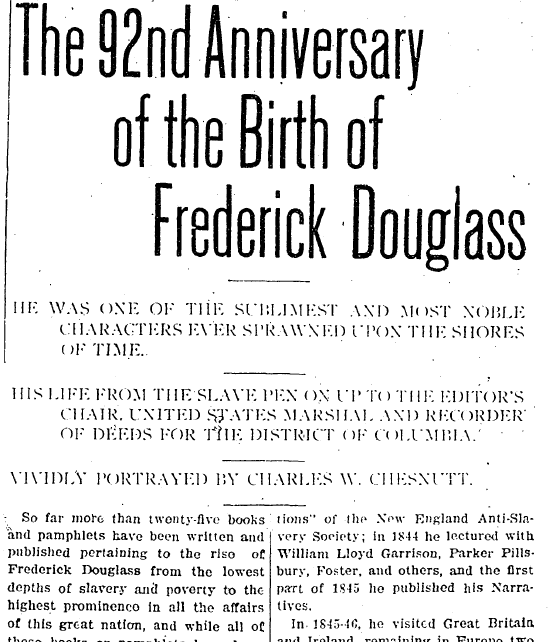 I’d encourage you to take some time, delve into the newspapers of GenealogyBank’s online collection, and really investigate Frederick Douglass, one of America’s finest!